Told through the voices of four women at the heart of the project, Seven Seasons on Stowel Lake Farm is a multi-layered, evocative exploration of life on a sustainable organic farm that has been at the forefront of North America's slow living and local eating movements. Stunning photographs and transporting descriptions of nature feature alongside mouthwatering yet uncomplicated recipes and crafting tips. Readers are transported to life on the farm while learning some of the tips, tricks, secrets, and recipes grown from years of work. Local harvest, slow food recipes include Squash and Sage Risotto, Wild Spring Nettle Soup, Herb-Encrusted Leg of Lamb, Pavlova with Roasted Rhubarb Compote, and Fresh Ch vre Cheesecake, nestled alongside key seasonal activities such as maximizing spring vegetables, saving seeds, making nature tables, and dying eggs. Suggestions go deeper than simply the practical, however: Seven Seasons shares emotional lessons from community living and prioritizing family, including the importance of sharing gratitude, the importance of walks, and celebrating together. 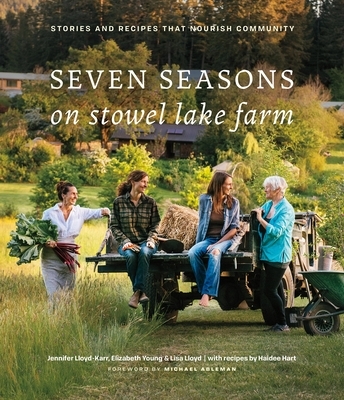 Seven Seasons on Stowel Lake Farm is more than a book, it's a place: one that readers can immerse themselves in time and again, through recipes, storytelling, and lessons. Steeped in insights that celebrate nourishment--both physical and emotional--this stunning, original book will inspire readers to cultivate their own rich traditions of food, family, and community--wherever they live.